Western Turkey, Anatolia, Yortan culture, ca 2500 BC. Early beaked pottery jug with almost-perfectly rounded base, beaked spout and rounded looping handle. Three small raised nodes on the sides. Size: 17,5 cm. high - rare this large! Rare Mesopotamian Clay figurine of Ishtar inscibed w long Cuneiform! Very rare inscribed clay / pottery figurine of Astarte / Ishtar, likely Old Assyrian, ca. 1800 BC. A fine and completely undamaged figurine, Ishtar wearing a large headdress or brown and braided hair, perhaps also with outlined wings. As the most interesting and surprising she is inscribed with a long and clear inscription on the back in Cuneiform, so far untranslated. Indus Valley Zoomorphic Terracotta Rhyton, shaped as a Ram! Zoomorphic Terracotta Rhyton, shaped as a Ram, Indus Valley, dating approx 2300-1900 BC. Finely sculptured animal, glazed in red and black. A very rare type of vessel, seldomly seen on the market and demanding high prices. Size: 16 x 17 cm. Provenance: Jytte Soelberg Private Collection, bought in the 1970s-1980s. Indus Valley Zoomorphic Terracotta Rhyton, shaped as a Bull! Finely sculptured animal, the upperpart glazed in cream and black stripes. A very rare type of vessel, seldomly seen on the market and demanding high prices. Size: 21cm x 12cm x 10cm. Large and rare Amlash grey ware zoomophic pottery vessel! 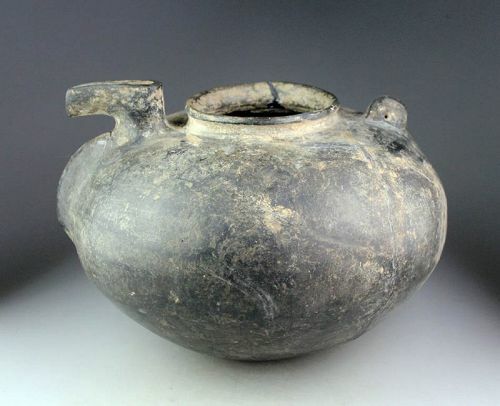 A very large and rare Amlash grey ware zoomophic pottery vessel. A huge piece for type and culture. Ancient Near East, Amlash or neighboring cultures, 1300-1100 BC. Finely sculptured to look like a large bird with the beak as the sprout of the vessel. Size: A massive vessel!. Around 33 cm. wide and ca. 23-24 cm. high. A rare and interesting inscribed clay tablet, Cuneiform inscription and imprint of a cylinder seal, Neo-Sumerian, ca. 2000 BC. This Ur III administrative text records in Sumerian cuneiform, it's so far untranslated and was issued at Umma. 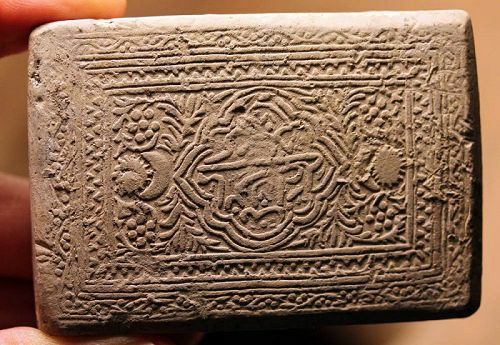 The tablet also shows an imprint of figures from a cylinder seal, thus quite scarce. Size: 44 mm. long and 37 mm. wide. Condition: Nice and intact, with some old laquer or glace. 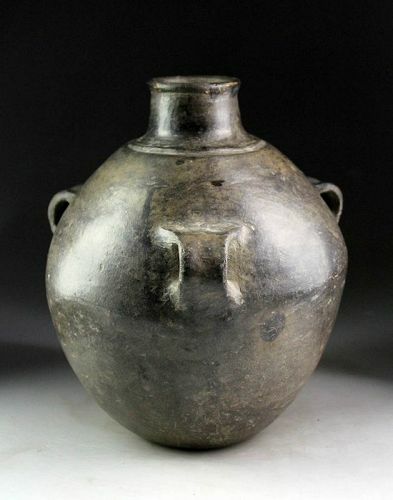 Large ancient Amlash grey ware storage vessel, ca. 1000 AD. 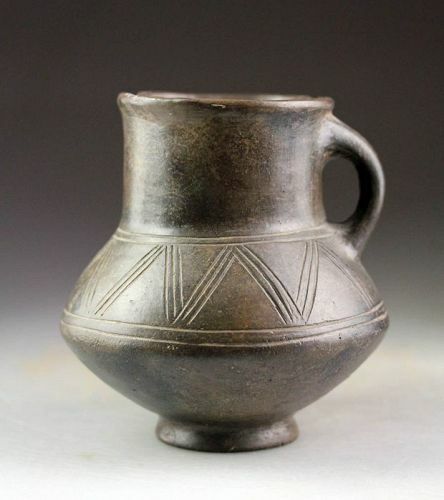 An interesting very large Grey-Ware vessel, with three handles, Amlash, ca. 1100-900 AD. 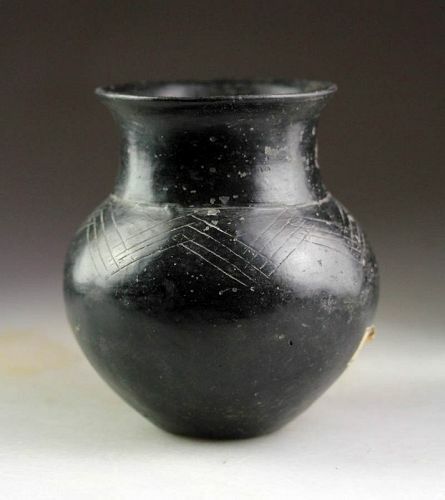 The vessel from the ancient makers of the famous spouted jars in the region (city) of Amlash. Finely sculptured vessel with three large handles and a full body and narrow base. With small Spout. Sumerian Cuneiform large fragment of a Foundation Brick! A highly interesting and quite rare larger fragment of a burned clay brick - likely a foundation brick, Sumerian/Mesopotamian, 3rd. millenium BC. A beautiful antiquity, so far untranslated and full of Cuneiform letters, which traditionally mentions the local ruler that raised the city or building. Size: 13,5 cm. high and 10 cm. wide. Condition: Choice, the cuneiform is very sharp. A beautyful Bamiyan splashed sgraffiato dish, c. 1100-1200 AD. The dish has a thick green & white glaze, the inside surface incised with simple ornamentations. Condition: Choice! The dish is intact and with the original, completely un-restored, glaze. Boobles and flaws are from the making and there's a few minor ancient dents. A rare & choice islamic pottery dish dating to 11th-12th cent AD. The dish measure 146 x 30 mm and has a beautiful torquise / blue glase. The bowl is in choice condition - intact but with some restoration and a few dents to the glaze. A carved pattern of floral petals on the side of the interior. 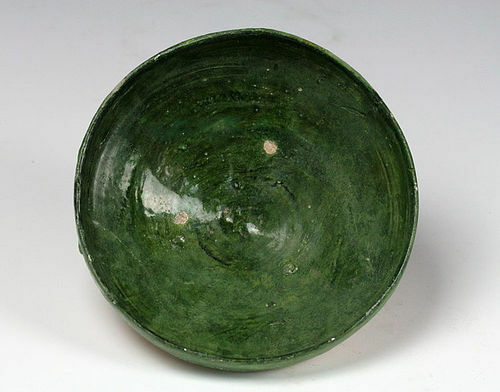 A large and rare pottery bowl w. glazed interior dating to 10th-12th cent. AD. The vessel is quite heavy and in a very sound condition. The bowl meassure 192 x 82 mm. and is a rather large specimen. Condition: Choice, original surfaces with limited restoration.